One day this summer my younger son Oisín and I strayed from a heavily wooded trail on the Muckross peninsula in Ireland’s Killarney National Park and entered a narrow limestone cave. The entrance was fringed with vegetation, a pelt of moss on the rock, tendrils of tree roots exposed, so that entering that cave felt like climbing into the bearded mouth of a living thing. We paused a moment in the gloam just as I had done 30 years before, when I visited for the first and only other time. Then we began a shallow descent into a throat of absolute darkness. When I first slipped into this cave all those years ago, I was claustrophobic and the pressing of our small group of youthful conservation volunteers panicked me. Their stops and starts, their mirthful howls as they feigned mild terrors ahead, made me anxious to turn back. But I was sandwiched between my peers and my only option was to stumble on. Fortunately, after no more than 100 lightless metres, an opening became visible, the cave being actually a passageway, and I pushed those ahead of me until we spilt back into the day. Perhaps it was the panic and the feeling of having been spat back into the world that made that woodland appear to me like no other. It seemed to be a forgotten world, like those beloved by our science-fiction writers. For this is indeed a landscape like few others. It is Reenadinna, one of the planet’s few remaining yew woods, a virtual monoculture of coniferous yew trees (Taxus baccata). They grow here on thin mossy soil, though in some places they drape directly over bare limestone bedrock. The light is green-soaked and dim beneath the crowded canopy: it looked no different this summer than it did 30 years before. Of course, three decades is a short time in the life of a yew wood, where an individual tree can live thousands of years. But it looked no different this summer than it would have done in September 1776, when Arthur Young, the great English writer on rural affairs, visited the region and exuberated on the wooded Muckross peninsula. And by the calculation of Fraser Mitchell, a botanist in Dublin’s Trinity College, it has looked that way for millennia. The stability of this ancient yew woodland, capable of rebuffing storms, insect outbreaks and other moderate disturbances, embodies an original tenet of ecology going back to the late 19th century. I’m talking about the so-called ‘balance of nature’. Henry David Thoreau coined the word ‘succession’ to describe the predictable and progressive development of vegetation from the weedy colonisation of newly exposed rocks to the stable and balanced state of a mature system. Bare ground is colonised by a few hardy plants. These give way to a new suite of species, which in turn can be superseded by yet more species. At last, mature vegetation (forest trees, for instance) establishes itself and persists, generation after generation. Succession was ecology’s first significant conceptual scaffolding. Upon this, the young scientific discipline was built. Nature in this view of things is stable and balanced until humankind, that agent of derangement, interferes with it, after which it can wither away. The term ‘balance of nature’ raised the hackles of some scientists as early as the first decades of the 20th century. The Oxford ecologist Charles Elton forcefully claimed in his book Animal Ecology (1927) that ‘the balance of nature does not exist, and perhaps has never existed’. Nonetheless, it remained central to the highly influential systems thinking of the late and celebrated American ecologist Eugene Odum. Think of an ecosystem as something like an individual organism: the adult develops in an orderly, predictable way from the child. Similarly, Odum argued, the trajectory of natural systems was preordained too. In the mid-20th century, Odum modernised the concept of succession, so central to early ecology. He turned it into a mechanistic account of how organisms and their environments interact to produce orderly and predictable results. He identified 24 trends that might be expected to develop as ecosystems mature, each of which was like a physiological marker of a functioning organism. One of these was ‘overall homeostasis’ — the ability to retain equilibrium in the face of change, just as our bodies keep a stable internal temperature. The ‘development’ of a mature ecosystem led to a stable whole. When severely disturbed, the system would simply rebound to balance. One of Odum’s favourite catchphrases was that ‘the whole is greater than the sum of its parts’. Complex ecosystems contain surprises just as living organisms do — this explains some of the force of the superorganism analogy. Due to its complexity as a system, a living body has qualities that its constituent parts cannot have. If you can’t imagine emergent properties, think of a carcass that has lost the body’s lustre and, with it, the emergent properties of the living. Odum was explicitly committed to the idea of a balance of nature. Stability and equilibrium were at the heart of his ecological thinking. But it hovered in other, less obviously philosophical, ecological thinking too — such as the theory of island biogeography posited in 1967 by Robert MacArthur and EO Wilson. This theory predicts that the number of species on an island will be the outcome of a dynamic balance; an equilibrium, that is, between immigration to an island and extinction rates of those populations. The trouble was, an attachment to ideas of balance and stability didn’t seem to match the messy dynamic reality of nature. And, increasingly, ecologists were troubled by what it all meant. Daniel Simberloff, a former graduate student of EO Wilson’s, was the one to pull the old ‘balance of nature’ idea to pieces. His work in community ecology, looking at the distribution and diversity of species, led him to see it as hardly a scientific idea at all. In 1980 Simberloff published a formidable and hugely influential paper called ‘A Succession of Paradigms in Ecology: Essentialism to Materialism and Probabilism’. It was a biting critique of the holistic concept of the ecosystem. Simberloff wondered why ecosystem ecology has been so seductive when, as far as he could tell, it simply did a bad job of explaining the observables of nature. Is it, he wondered, because it legitimated the notion of a self-regulating market in ‘unfettered capitalism’ — an invisible hand predictably driving a system to a preordained end? Noting the impeccable Marxist credentials of many ecologists, he conceded that this might not be the reason. No, he argued, chief among the reasons for the continued appeal of ecosystem ecology was that ‘it accords with Greek metaphysics’. The holistic ecosystem reflects the idealism of Plato and the essentialism of Aristotle. Because Odumite ecosystem ecology was rooted so profoundly in ancient world views, in notions of nature in balance, it would not, warned Simberloff, vanish easily. Nevertheless, it should be grubbed out of the science of ecology wherever possible. Metaphysical assumptions had no place in a respectable science. If 20th-century ecology was marked by an infatuation with balance, then our era is one of disturbance, disruption, non-equilibrium, stochasticity, chaos, and randomness. This new ecological world view extends not only to semi-arid grasslands such as the shortgrass prairies of western America or the Mongolian steppes — systems that have long been recognised as turbulent — but also to old-growth forests long seen as stable. Viewed from the long-time perspective, Reenadinna yew woods are evanescent, emerging only a few thousand years ago from a prior woodland dominated by pines, oaks, elms, and hazel. It looks as though the popular idea that ecology is about intricately balanced, harmonious and stable systems is completely out of step with the science. But has something been lost in the process? A few years ago, this time with my friend and colleague Randall Honold, I travelled to a remote ecological reserve at the confluence of the Western and Eastern Ghats in south India. We were there primarily to look at wildlife, for these mountain ranges are exceptionally rich in species, many of which are found nowhere else on earth. The Western Ghats are one of the world’s dozen or so global hot spots for biodiversity. They were declared a World Heritage Site earlier this summer, around the time of my visit back to Ireland’s yew woods. The Biligiriranga Hills Reserve is a day’s drive from Bangalore. As a place, Bangalore is all people, buildings, blatant smells, and phonic surprise. The Ghats, by contrast, are calm and subtle. Their demeanour is patient, abiding. It was months after the monsoon. The soils were dry and the air was clear when we travelled with three Soliga tribal guides into the heart of the reserve. The mammals of this reserve include deer — barking deer, sambar, and chital — as well as tigers and, famously, a herd of elephants. We were made aware of the elephant population in an especially terrifying way. An agitated female charged us. She broke from the brush at dust-billowing speed, her ears flaring. Just when impact seemed inevitable, she swerved behind our white jeep. Before us was a lake. Behind us was an irate animal. The forest was hushed. With nowhere to go, we waited. The elephant, viewed in the rear-view mirror, was all but motionless, although a tiny swaying of her body suggested that she was trying to resurrect an anger requisite to finish what she had started. Randall snapped a picture: ‘Objects in the mirror are closer than they appear.’ We sat more or less frozen, for this was the advice of our guides, one of whom later said that this was the closest he’d come to death-by-elephant in 40 years. Perhaps it says unflattering things about me that I felt bored, impatient even, in these minutes waiting for my demise. I cast a minuscule glance around the forest and noticed that the wall of vegetation from which the animal had exploded was made up of Lantana camara. This is an especially aggressive exotic shrub which has become a management nuisance throughout the Western Ghats. Spanish Flag, as it is commonly known, is native to the American tropics and is regarded as one of the world’s most invasive plants. Its flowers, as I noticed then, are exceptionally pretty. Having spent half a lifetime combating non-native shrubby vegetation in Ireland and in the American Midwest, it seemed fitting, though ultimately a little dispiriting, that a non-native shrub had just disgorged the raging agent of my death. After 30 minutes, the elephant retreated, as did we. Later, how we laughed. A leading hypothesis of our Soliga friends was that my hair, an outmoded snowy-white hank, had enraged the animal. A year later, when we revisited the field station at the Biligiriranga Hills Reserve with a group of students, the ‘elephant and the hair’ story was still going strong. Stories persist. Ecosystems, however, do not. By this time the elephants had left this part of the reserve and were seen neither that second year nor the year after. The walls of Lantana had become even more pronounced. Vigorous before, the invasion had reached that critical point where, in some places at least, the plant was occupying so much space that wildlife was being crowded out. Along with the spread of the invasion, the diversity of plants is changing as well. And perhaps, if we embrace an ecological paradigm of disturbance and change, this is simply the way nature works, and nothing to be done about it. Or is there? In its brief history, the science of ecology appears to have smuggled in enough ancient metaphysics to make any Greek philosopher nod with approval. However, the question remains. If the handsaw and hurricane are equivalents in their ability to lay a forest low, it is hard to see how we can scientifically criticise the human destruction of ecosystems. Why should we, for instance, concern ourselves with the fate of the Western Ghats if alien introductions are just another disturbance, no different from the more natural-seeming migration of species? The point of conservation in the popular imagination and in many policy directives is that it resists human depredations to preserve important species in ancient, intact, fully functional natural ecosystems. If we have no ‘balance of nature’, this is much harder to defend. If we lose the ideal of balance, then, we lose a powerful motive for environmental conservation. However, there might be some unintended benefits. A dynamic, ‘disturbance’ approach has fostered some of the most promising new approaches to environmental problems such as urban ecology and restoration ecology. That’s because it is much less concerned with keeping humans and nature separate from one another. The thing is, both balance and flux are undoubtedly aspects of nature. A new view of nature that combines them in a way that both scientists and the public find compelling is needed. We should bridge the present disparity between ecology as a science and ecology as a romantic idealism about nature, not only for intellectual reasons but for the sake of robust public policy. Ecology, after all, needs to explain both the stability of a yew grove (a woodland that persists for more than 3,000 years commands attention), as well as the rapid transition of forest in the Western Ghats. One promising middle path that integrates balance and disturbance has emerged in recent years. Referred to as ‘resilience thinking’, it builds on the work of the Canadian-born ecologist CS Holling and has been developed in recent years by an international collaboration called the Resilience Alliance. Resilience thinking assumes that change and disturbance are an integral part of every system, but that some systems are more resilient to destructive change than others. This might seem a subtle point, but if we understand the processes that promote or restore resilience, we have a much better chance both of mopping up after ecological catastrophes – or of avoiding them altogether. Resilience thinking can be applied to economics (the capacity of financial markets to absorb shock), friendship (the capacity of our loved ones to tolerate our nonsense), and nature (the capacity of ecosystems to endure disruption). One of the striking findings is that diversity is crucial to success. When an ecological system is managed for just one factor (say, a single crop) or where a nation’s wealth is dominated by a single economic sector (say, the housing market before the 2008 global financial crisis), the result is a loss of resilience. Resilience thinking ultimately theorises about the limits of a system’s capacity to endure. Financial markets collapse, crops fail, love blanches, ecosystems unravel, and death, alas, is a part of every life. What of the resilience of the two woodlands we have visited? The Killarney yew wood has been stable for a long time, but the oak woods that surround them have been inundated with invasive shrubs. The next time I pass through the limestone passage on the Muckross peninsula, the yews might have been overwhelmed. It seems that excessive deer browsing is preventing them from regenerating. Managers in the National Park are attempting to fence out the deer population. The montane woodlands of Biligiriranga Hills Reserve are in even more rapid transition. 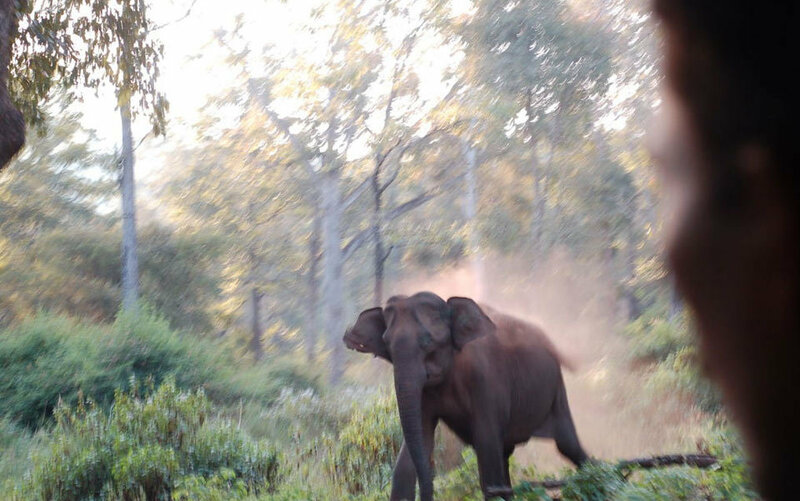 That’s partly due to the invasion of the Lantana, which sheltered our charging elephant. A Soliga colleague of mine claims to have seen an elephant walk along the top of huge Lantana hedges ­— a thought that had made me smile while I waited, motionless, for our elephant to leave. The entire landscape is being changed by this invasive species, affecting vegetation, animals and human livelihoods alike. One experimental solution is that the Soliga use the plant in their woodcraft. However, once the resilience of a system has been breached, it is very difficult to return it to its original state: it might have crossed a threshold that cannot be recrossed. Ecosystems that have been damaged are often damaged irreparably. The cost of restoration projects, we know, is very high, so if we value the diversity of the Western Ghats, we need to prevent this switch from ecological delight to impoverished catastrophe. The idea of resilience provides an ecologically accurate, powerfully intuitive reason for protecting species and habits everywhere, from Ireland to India. Good management of these ecosystems will require extensive knowledge of those ecological forces (competition, predation, mutualisms and so on) that create the natural patterns we see. Managers also need knowledge of those disturbances — fire, pest, storms — that have historically rejuvenated the forests. What precisely we do with this knowledge calls for ethical judgments of the most practical kind. This is a conversation that involves all of us, scientist and layperson alike. My son tells me he wants to revisit the yew woods in a few decades. I hope they endure. And if he ever visits the Biligiriranga Reserve Hills, I hope the elephants have returned to the heart of the reserve, if only to teach him that some cataclysms are worth avoiding.